A team of professional staff are at your service. And should you wish to venture out, the white sandy beaches and world-class surf breaks of The Bukit are just a few minutes’ drive away. 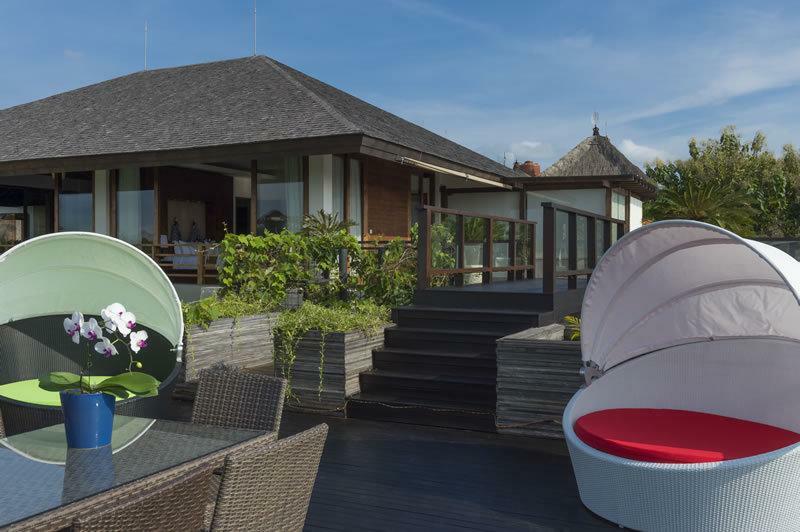 The villa embodies the ancient Chinese philosophy of yin and yang: presenting a striking interplay of light, space and airiness balanced with classic architectural lines created from teak, marble, granite and recycled ironwood. 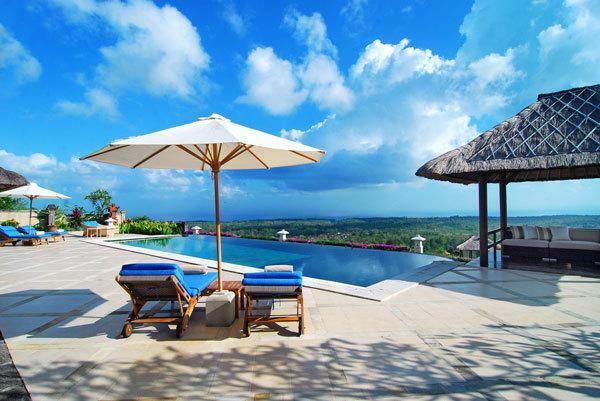 Every space here – indoors and out – makes the most of the villa’s spectacular hilltop location. No matter where you are, the view is simply breathtaking. Children will love the villa. 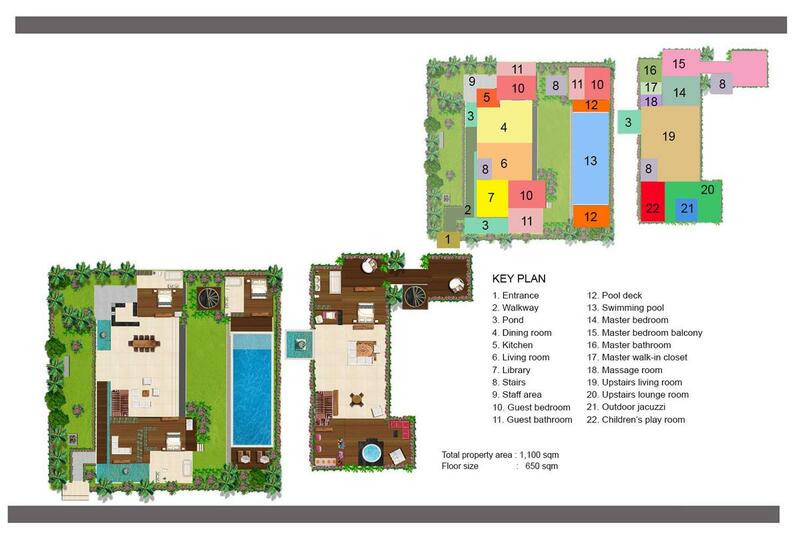 They can run around on the big lawn adjacent to the main house, play hide and seek around the grounds, splash about in the pool and chill in the air-conditioned playroom, which is equipped with a doll’s house, kitchen set, games, crafts, books, and toys, to keep them entertained for hours. There’s also a fantastic selection of DVDs, plus Xbox and Wii for the young and young at heart. The grassy pool surround and the breezy upstairs deck are both great locations for sophisticated and intimate celebrations. 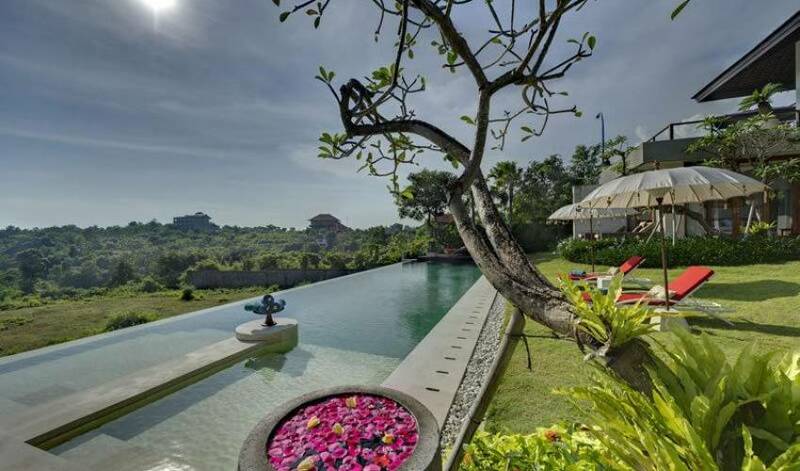 Whatever your needs and desires, the warm, caring and professional staff will ensure that you experience an unforgettable Bali holiday. 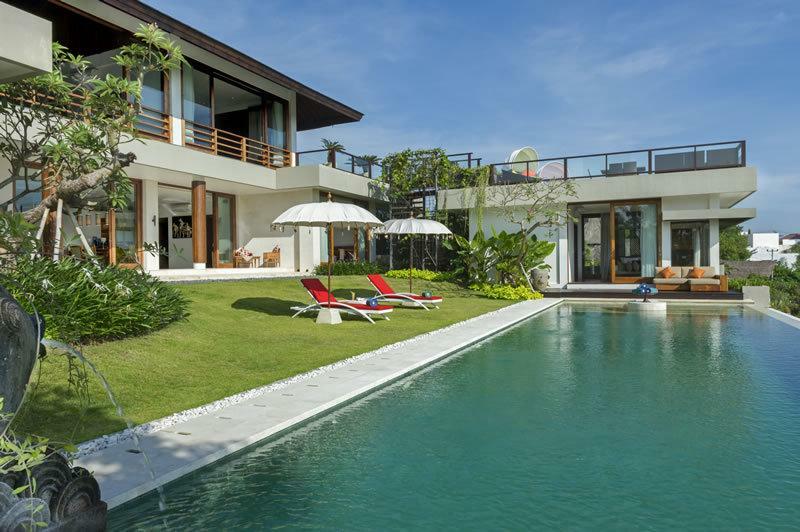 Set over two levels, and with fabulous views from every room, this spacious, light-filled villa flanks two sides of a 15-metre infinity-edge pool bordered by a tropical, lawned garden. 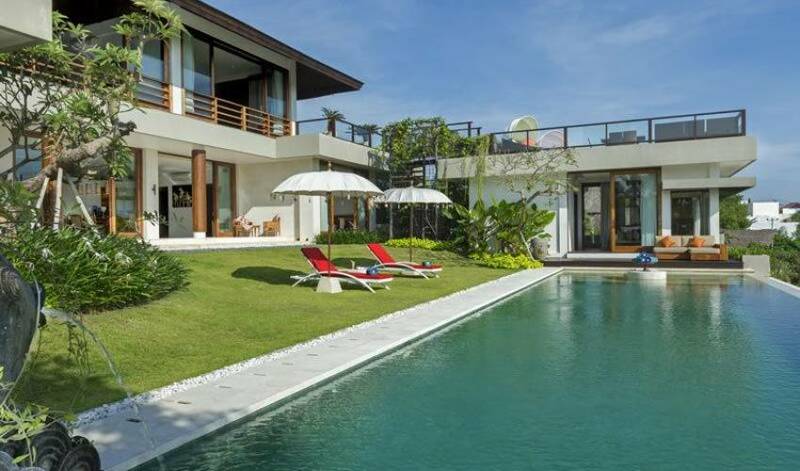 The ground floor, comprising three ensuite guest bedrooms and a spacious open-plan living, dining and kitchen area, is fronted by enormous glass doors which can be closed to provide the ultimate in air-conditioned comfort or thrown open for an authentic Balinese outdoor-living experience. A small library, adjacent to the living room, offers sanctuary for guests seeking peace and quiet. 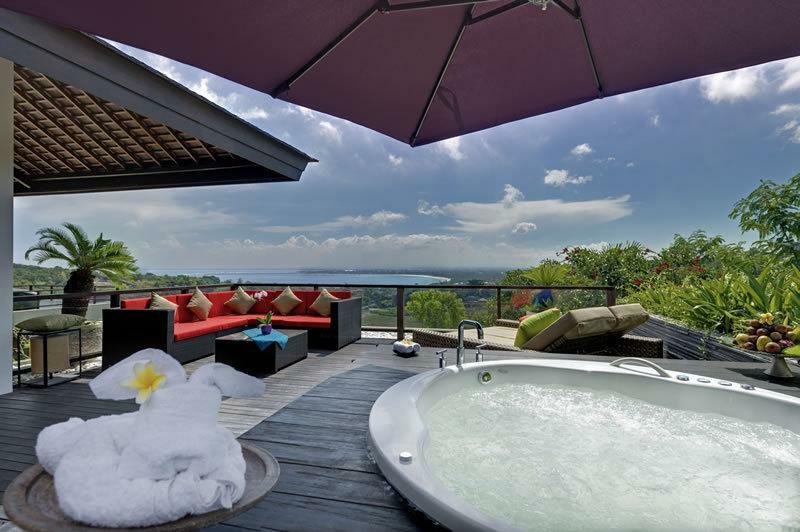 The magnificent master bedroom, with its equally spectacular ensuite bathroom and ocean-view balcony, is situated on the upper floor, as is the kids’ playroom, spa room, a second indoor living room and a balmy rooftop terrace with jacuzzi. 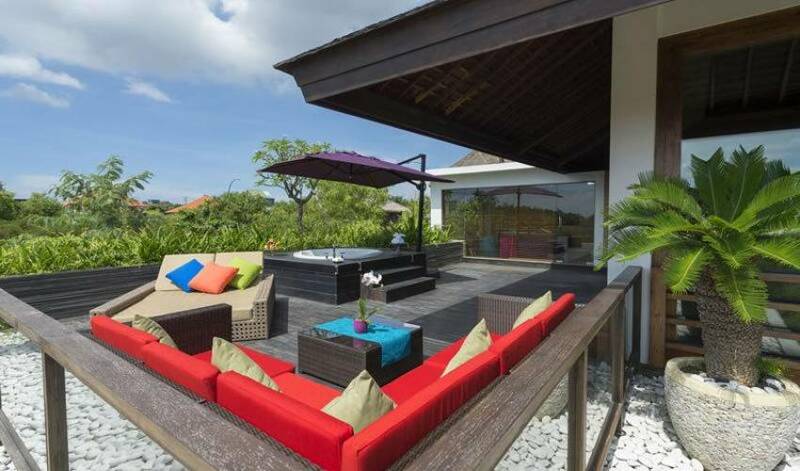 The villa features two fabulous lounge rooms. The first, on the ground floor, overlooks the manicured lawn and swimming pool and is part of the open-plan living, dining and kitchen area, where an imposing, blond wood, ten-seater dining table lies next to the sleek modern kitchen. Also on the ground floor is the library, a wonderful spot in which to relax on the stylish leather sofas and read a book. The spacious upstairs living area is a great retreat – kick back and watch television or sink into the couch and enjoy an afternoon snooze. Young guests will enjoy their own kiddie utopia in the air-conditioned second-floor playroom, which opens onto a spectacular rooftop terrace. 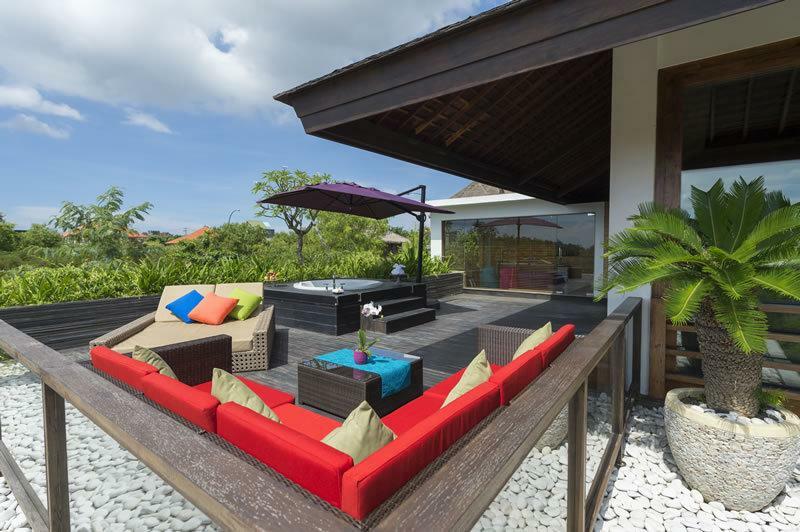 The villa has a plethora of outdoor spaces to take advantage of the island’s wonderful climate. 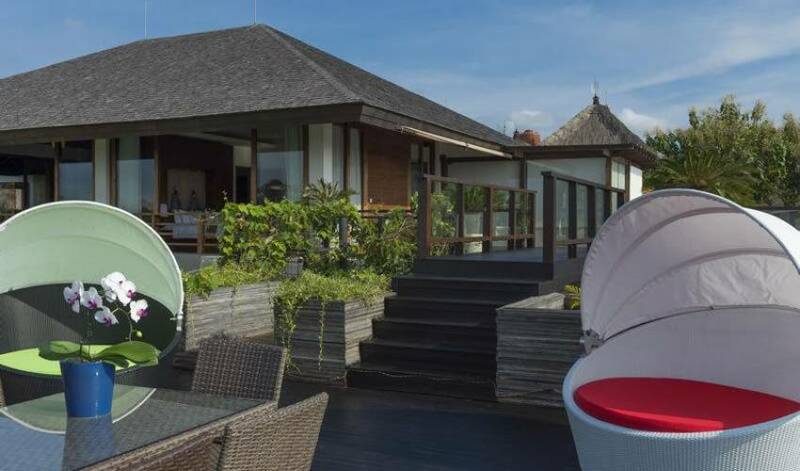 Luxuriate in the open-air jacuzzi, share a love seat on the rooftop terrace and watch the sun set over the ocean, relax on a poolside sun lounger, or dine under the stars and watch the lights of Jimbaran reflecting on the ocean below. Glass sliding doors and expansive windows ensure that the villa’s enormous master bedroom is wonderfully light and airy and makes the most of the panoramic views. 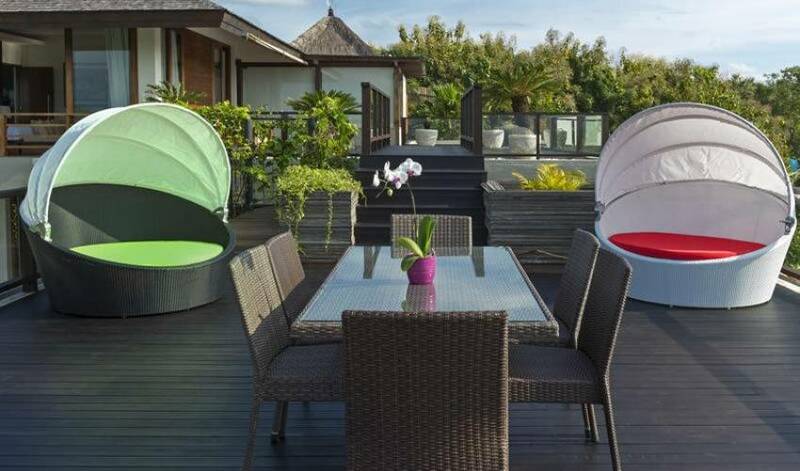 This tastefully furnished room, with rich, warm wood flooring, features a king-size bed and opens onto a balcony linking to a rooftop terrace furnished with canopied double sunbeds and a dining table for enjoying alfresco meals (the terrace can also be accessed from an external flight of stairs). The master ensuite is simply spectacular. This bright, sleek bathroom is fitted with twin sinks and a rain shower, while an enormous tub set below a glass roof is just made for starlit bathing. The three guest bedrooms on the villa’s ground floor are fitted with floor-to-ceiling glass doors, again making the most of the wonderful views. 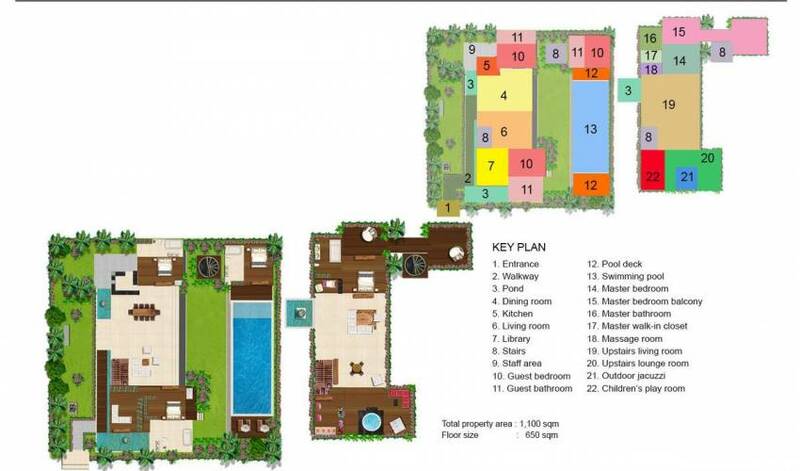 Furnished with king-size beds they feature outstanding ensuite bathrooms with rain showers and generously sized tubs. 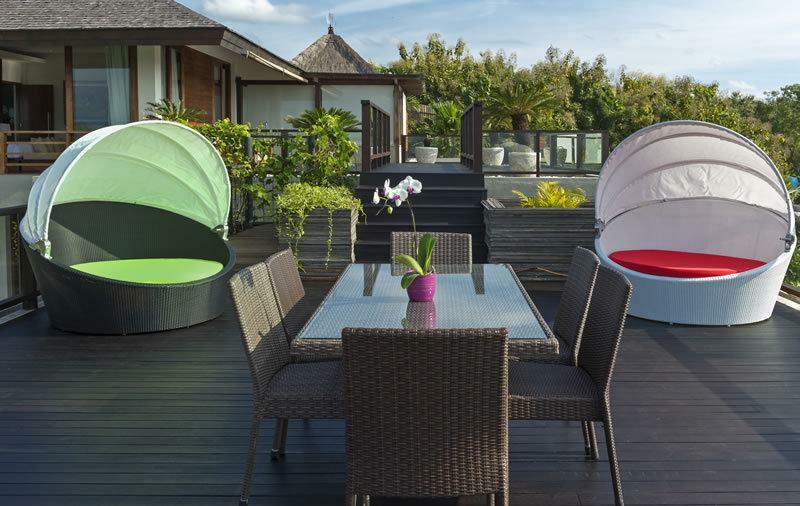 Two of the rooms have shaded, furnished balconies that face the pool, while the third is accessed from the dining and kitchen area. All bedrooms are air-conditioned and equipped with 32-inch television screens. 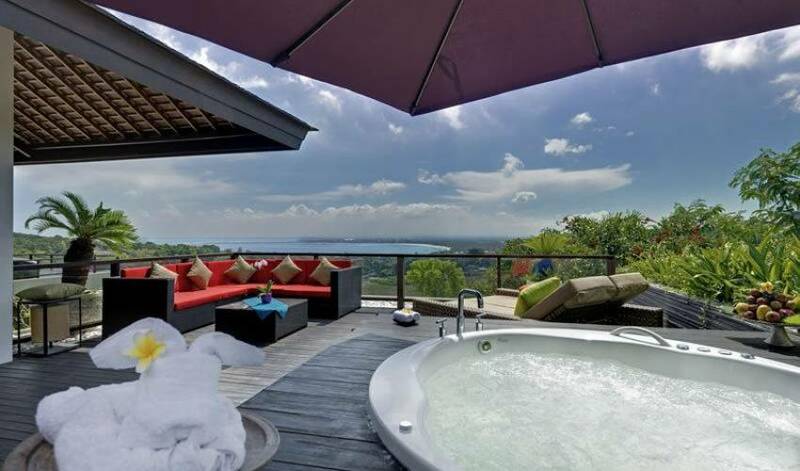 Aiko is located on a hill overlooking the seaside village of Jimbaran and is just a short drive from the calm and safe white-sand beaches of Jimbaran Bay. The area around the villa is also home to many five-star resorts offering the ultimate in fine dining. 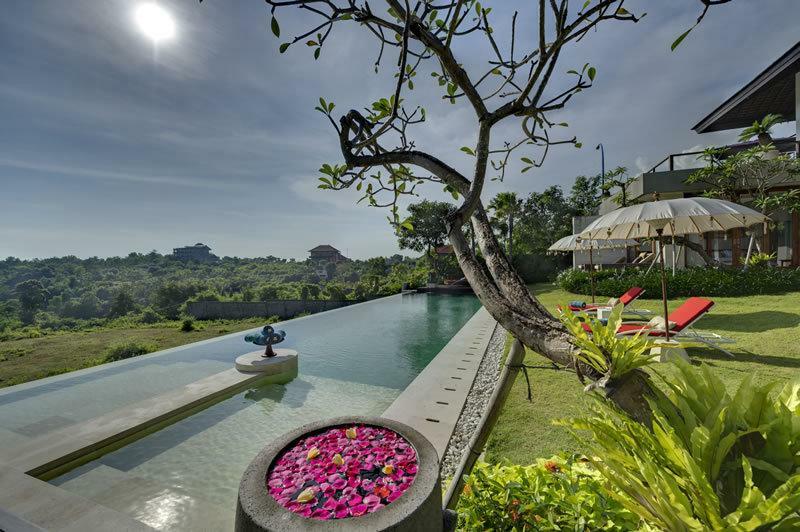 And the championship standard, 18-hole New Kuta Golf course, with its dramatic cliff-top setting, is only four kilometres from the villa.